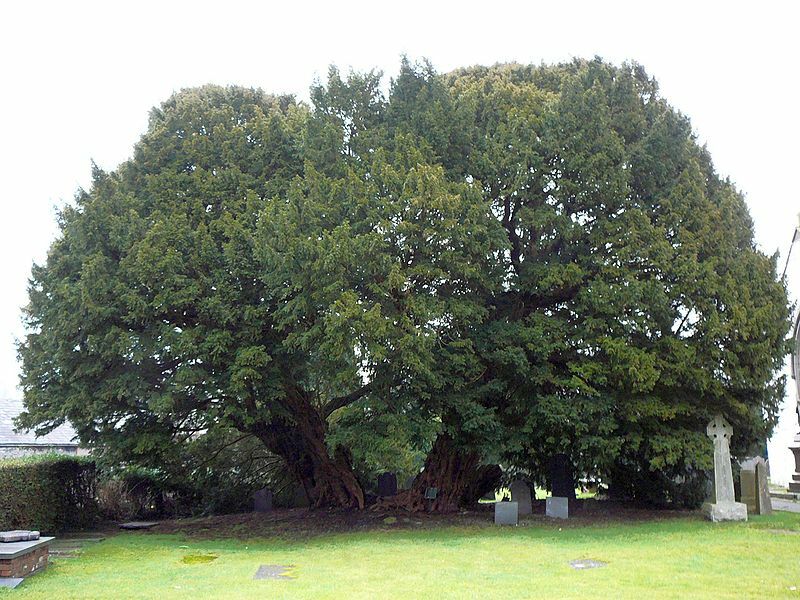 Yew Trees are amongst the oldest living plants and have many folklore associations some of which might be quite offensive to twenty-first century humans so, if you are squeamish, brace yourself for the last paragraph. The word Yew comes from the Anglo Saxon word Giuli, the same stem word as for Yule. The Yule Log was originally an oversized hard lump of yew wood that was left burning on the fire for 12 days; I do not know at what point in time it transformed into an oversweet chocolate cake that I baked on Christmas Eve when my children were still young and lasted in my larder for 12 minutes. The Gaelic word for yew tree, however, is Ioho or Ioha and the Scottish island of Iona probably derives its name from the groves of sacred yew trees planted there; Iona was once a powerful Druid Centre. There is a famous tree in Perthshire, Scotland, called the Fortingall Yew which is thought to be between two and five thousand years old. Beltane Fires used to be lit every year in a cleft of its trunk and a popular legend claims that Pontius Pilot played in its branches as a child. In Irish mythology the Yew is one of five sacred, and/or magical, trees brought from the Otherworld. In the Celtic Calendar the Yew Tree sat where the Old Year became The New. The Yew is often described as the tree of birth, death and rebirth. When the tip of a branch touches the ground it frequently puts down roots and another trunk is formed. New vertical growths either inside a decayed hollow trunk or outside of the original trunk may also occur and this ability to renew its vigour is why the Yew is regarded by many as Immortal. Rings of Yew will often grow if the original tree is left to its own devices. The tree is associated with death in several ways; one example is that English bows were made of Yew and used to kill thousands of men in war. Many churchyard Yews were growing in that place long before the church was built and not planted to make sure the farmers kept their cattle well fenced in for fear of poisoning, as is commonly suggested. It is thought that Pagans associated Yews with preventing the dead from walking and Christians adopted this belief to bring Pagans into the Church. The shallow net of roots is regarded as impenetrable by the spirits and, more gruesomely, that the roots grow into the eyes of the dead so they cannot see their way back. However, others believe that the berries and bark are red because the roots grow into tongues, thereby giving a voice to the dead. Either view gives the story writer plenty of ideas for a macabre tale. I sat by the pond to do some editing but the damselflies flew in! The Garden at Oxleaze Farm, Filkins. Images and stories from my travels and life in the Northern Territory and Queensland.